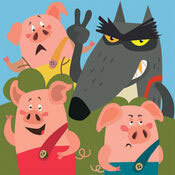 The Adventures of the Three Little Pigs, a book app for kids, is a delightful twist on this age old tale. The graphics are of a stunning high quality and it’s obvious that a great deal of thought went into the production. In this book app, each segment has an educational aspect for kids to explore and encourages participation in the progress of the 3 Little Pigs. Your preschool and early grade kids will be enticed to come back for more interaction by the very appealing background music and positive reinforcement for a job well done. This award winning app is ad-free and kid-safe.Highlighted text makes this app another great early reading readiness tool. There are three language versions to choose from, providing the opportunity to introduce another language. The developer, Irene Deev, worked with a team and produced an app that will be a rewarding addition to your kid’s Toolbox for Life 😉 Be sure to check out her comments below. Being a young businesswoman and mother, I came across the idea of working together with a highly motivated and capable team to create and bring to life a children’s app. The app is targeted towards children of pre-school through to primary school age and who are already searching for IT-based media with a look towards appealing fairytales. For me, it was important that the media and how it is worked through was tailored to children of this age group and that the child can have fun while being led through a learning experience. In the first few years of life, it is very important to be guided into this correctly. Learning should be fun; only then will learning be a success. My project – the interactive e-learning app “The Adventures of the Three Little Pigs” – is perfectly suitable for young children from the age of one year and upwards. Along with encountering the qualities of a children’s book, children are inspired to independently explore events within the app and to communicate with the app using diverse features. The result is a fun and playful learning experience. The story itself is split up into several scenes, each of which promotes the learning of particular competencies. As well as telling the story, the app poses questions and quizzes and requires games to be completed – the complexity of which is determined by the age of the child. Using my app, the idea that young children should not be using such media is set aside and the child’s learning needs and development are approached and promoted using a modern and effective solution.